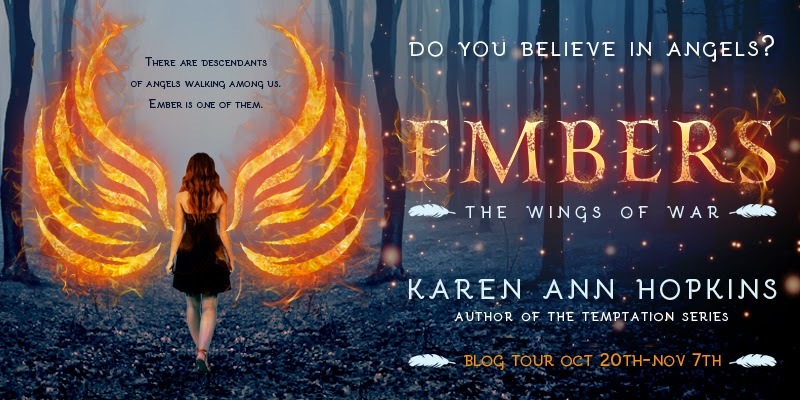 Today I am beyond excited to be a part of the Embers blog tour and share with you a few details about this wonderful book. There are several giveaways accompanying this tour. One winner will receive a $100 gift card, another will receive a signed Temptation Series book set, including Temptation, Belonging & Forever, and ten lucky winners will receive an eCopy of EMBERS! Don't forget to enter, and please make sure to visit the other tour stops as well. A huge thank you to Jenny and Danny from Kismet for organizing this tour and running things so smoothly. The basic outline of Embers is similar to just about every other YA paranormal romance out there. However, once we start reading it and uncovering the world Karen Ann Hopkins has created for us, we quickly realize that it has more than enough to make it stand out. By the time we reach the second half, any comparison is long gone from our minds and the originality of Embers, the sheer strangeness, is all that’s left for us to notice. Yes, Hopkins’ refreshingly original idea is what makes this read truly worthwhile. Her worldbuilding is dark, bold and interesting and her characters far from being black-and-white. In fact, Ember’s romantic interest is basically a soul-eating monster, and still Hopkins found a way to make us sympathize with him and even like him. The paranormal elements in this book are quite different and extraordinary. 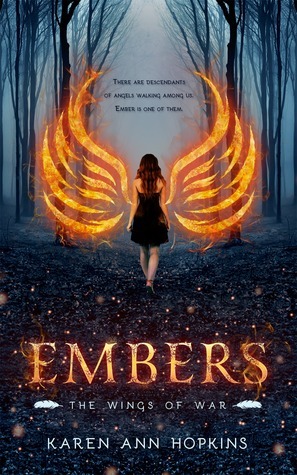 Don’t make the mistake of dismissing Embers as just another angel book when it’s, in fact, much, much more than that. Ember is such a likeable character from the start, perhaps a bit timid and antisocial, but more than ready to fight for her beliefs. She is a leader through and through, our Ember, not easily swayed by the popular opinion. I admired her for standing up for what’s right from the start and not being afraid to stand up for herself or someone else when necessary. However, due to his long life and morally gray existence, I found Sawyer to be a much more interesting character. His struggle to keep what’s left of his humanity was a constant source of tension, and his occasional slips, while rationalized and perhaps even necessary, quite painful for us to read. The romance, I’m afraid, didn’t work for me at all. It was instalove for Sawyer and instalust for Ember, with some very understandable caution on her part. The timing of things and the progress of their relationship wasn't what I'd hoped for at the beginning, and even in the end Ember’s reasons for being with Sawyer weren’t quite clear and her feelings weren’t believable to me. Nevertheless, I’d highly recommend Embers to fans of excellent worldbuilding. The ending left me questioning some choices and fearing for Ember’s future, both with Sawyer and among her own kind. I can’t wait to get my hands on the sequel. Aside from the romance, I'm so glad you enjoyed this one Maja! I love that what at first glance appeared to be a very typical YA paranormal in fact turned into something refreshingly different with really great worldbuilding. Thanks so much for being a part of the tour! Great review Maja, I do think I would like to try this still. I love anything stand out in this genre. I don't normally read angel books. Paula Weston's series is the only one that works for me, but I was very curious about this book since the beginning. I love the sound of the unique world building and the great characters. It's a shame about the romance though. I dislike instalove, so I don't think I will enjoy it as much. Still, I'm willing to give this book a shot! Hmm... I am not the biggest fan of angel type books, and I just did a romance with an insta love/insta lust situation and it was not for me. I like the sound of the world building and such so I might still read this one if I ever dig out. I'm glad that despite the insta love/lust component you were able to enjoy this book overall Maja! I admit that I'm a little wary when it comes to my paranormal sort of reads, but I'm glad that this book did have a lot of original and fresh things to offer! Fab review as always! Ok, unique take on angels and paranormal with amazing world building? YES please! I'm not too happy to hear about you not being too keen on the romance though, Maja. Yeah, even though it seems like the romance should have been a pass, I kind of want to meet Sawyer! He sounds like a good character. It's great to hear that this one did its best to be different among the many. Hard to find one of those these days!